Noodles: They're what's for dessert. 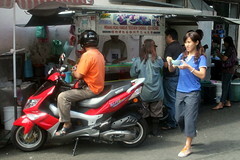 Pandan, or screwpine leaf, gives those short strips their pale green color and the faintest of herbal flavors. 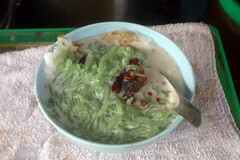 You'd hardly notice it, though: Chendul (more often spelled "cendol" but pronounced the same; rm 1.40, or about 40 cents at the time) is swamped in iced coconut milk laden laced with palm sugar. Multiple add-ons are optional; mine was garnished mainly with red beans.